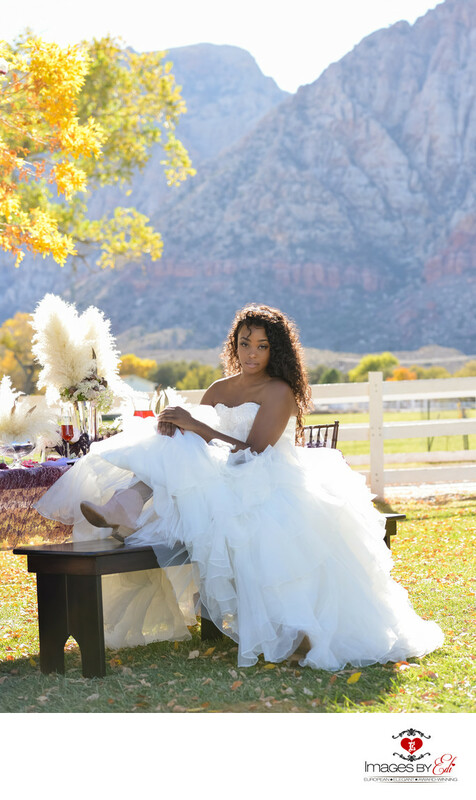 This image was created at the Bridal Spectacular Magazine photo shoot at Spring Mountain Ranch Las Vegas. Bride sitting on a bench in her princess wedding dress. The sun shining through her hair, mountains and a tree with yellow leaves are in the background. Spring Mountain Ranch is the closest in feel and also geographically to Red Rock Canyon to take pictures, if somebody doesn't want to pay $300 or more for permit for an hour photo session. Keywords: Bride alone (150), Las Vegas Wedding Photographer (624), Las Vegas Wedding Photography (642), Spring Mountain Ranch Las Vgeas Weddings (3).